I wouldn’t for a minute want you to think that this is a breakfast dish I eat regularly. It’s not. Most mornings it’s homemade muesli with yoghurt and fruit, or my latest obsession a green smoothie with chia seeds. But every now and then, when time and circumstances permit, I turn to this slightly exotic, utterly creamy, black rice. In my kitchen black rice would usually find its way into salads, be used in a vegetable fritter, or be served under a spicy beef curry. So I admire it for finding it’s way to my breakfast table. The nutty wholesome flavour agrees with my tastebuds and funnily enough, unlike white rice, it’s rather soothing on the digestive system. Probably because it’s gluten free. I’ve used fresh ginger, cinnamon, cardamom and cloves to delicately impart their flavours, and honey to sweeten at the end. On other occasions I have instead used vanilla bean and pure maple syrup (also delicious). And always coconut milk. Slices of mango, now that they are in season, are sweet and tropical but not essential. The berries are though! These add a crucial sour taste and of course essential vitamins and antioxidants. 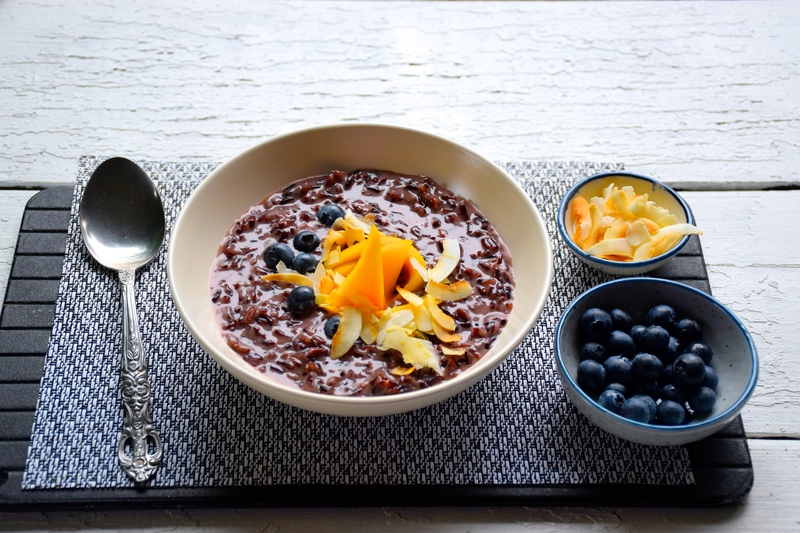 And with all the antioxidants already contained within this gorgeously coloured black rice (which actually turns purple after cooking) you’ll be super charged with goodness for what ever the day ahead may bring. Place the rice in a medium-small saucepan, cover with 500ml water, bring to the boil, turn down the heat and cook for 25 minutes. By this stage nearly all the water will have evaporated but don’t drain or rinse the rice. Add the coconut milk and bring back to the boil. Meanwhile, place the sliced ginger and cardamon pods in a small mortar and pestle and bruise lightly for the flavours to release. Add these to the rice along with the cloves and cinnamon. I don’t bother tying up my spices in muslin cloth as I don’t have a problem picking out the spices at the end. If this bothers you, maybe you might. Continue cooking the black rice on a gentle simmer for a further 15 minutes. Stir occasionally. Once rice is cooked, remove what spices you can find and stir through the honey. Set aside to cool slightly before serving. In fact in hotter weather it’s nice when it’s served almost cold. Divide the rice between bowls, top with blueberries (or any other fresh berry), sliced mango and toasted coconut chips. Hi Sandra. 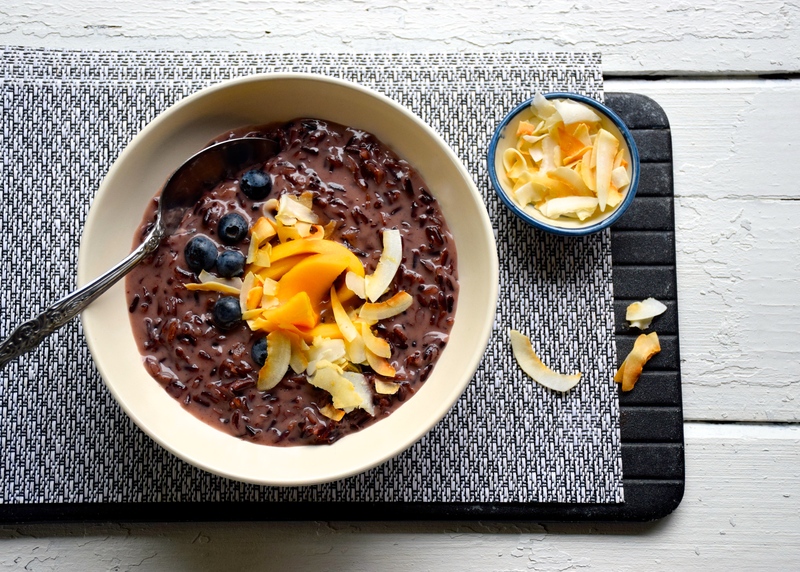 There can never be too many black rice recipes. Look forward to seeing yours. Sounds like the perfect combination of healthy and indulgent Michelle! Served cold, I think this would go down so well for summer breakfasts. I bet there’s some sweet mangoes up Brisbane way that would be beautiful used here.